I am always thrilled when I get invited to review Bible resource material. Between our family devotion time, my quiet time, and time spent in church and numerous studies there, I spend a lot of time in God's word. But that is not necessarily how I grew up and therefore I often still feel behind the power curve when it comes to basic Bible knowledge. There is no place better to go to learn about God and His word than to His book - the Bible! But often times, it is helpful to gain knowledge from those who have gone before us and spent much of their lifetime studying. How blessed we are to have people like that in the world. 30 Days to Understanding the Bible is the brainchild of pastor and author Max Anders, who has spent many years studying the Bible. This 385 page, paperback book is his attempt to pass along general Bible knowledge in an easy to read and understand way. 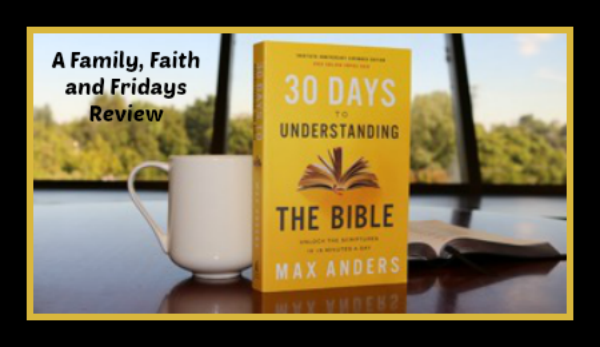 While he admits that 30 days is not enough time to learn everything, he suggests that in 30 days, about 15 minutes a day, you can learn about key people, events, and doctrines in the Bible, as well as a basic framework to increase your knowledge. Each of those sections, of course, are broken into numerous chapters, most being 6-10 pages long. Specifically, about a 15 minute read. Included in many chapters are charts, maps, pictures, and more. There are places for you to treat it like a workbook and fill in the blanks and at the end of each chapter is a self test to see how much you can remember. If our family had chosen to work through this book daily, we would indeed be done with it. Instead we have taken a slightly different approach. We chose to read one chapter a week out loud as part of our family devotions. We take turns reading as well as answering the questions. Then throughout the week we review as needed and test each other's memories. There is no doubt if you were going through this book alone you could indeed read it in 30 days and have gained a lot of knowledge. But if you are like my family, or maybe just me, you need more time to chew on the facts, memorize them, and make the yours. The extra time has also allowed us to dig deeper, often bringing in application- how does that affect me? What do I think about that? Why did it happen that way? What else does the Bible say about that? I love this gem of a book! While written for older teens and adults, it is easily adapted for younger children and be be read alone or with a group. Think of it as Sunday School on steroids! And know that while your head knowledge of the Bible increases, God is most certainly at work increasing your heart toward Him as well! Here is a great promo video to give you a glimpse of 30 Days to Understanding the Bible.